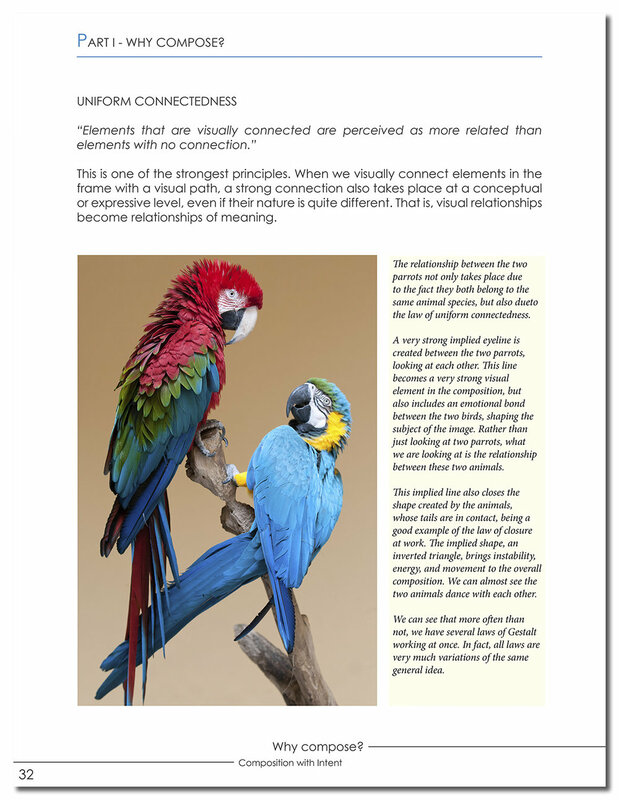 From Message to Print, this is the most comprehensive course of expressive photography ever made. You will learn in a year what takes most people more than a decade of full-time practice and study of isolated material. In this presentation, which serves as an introduction to the Master COURSE “Photography with Intent,” we undertake a rational deconstruction of the different elements that collide when an expressive and personal photograph is created. Certainly the subject matter we photograph is essential, as is the light that falls on it. But there are many more elements that mix and mingle when a creative individual uses a camera to express himself or herself creatively. Through a full hour, we will review these essential elements in the order in which they arise during the creative process. The intention is to show how all our images are created by the contribution of a certain number of different factors, some of them external to the photographer and some others inherent to the creative person behind the camera. Then, we will highlight how the contribution of each different ingredient can vary from one image to another. 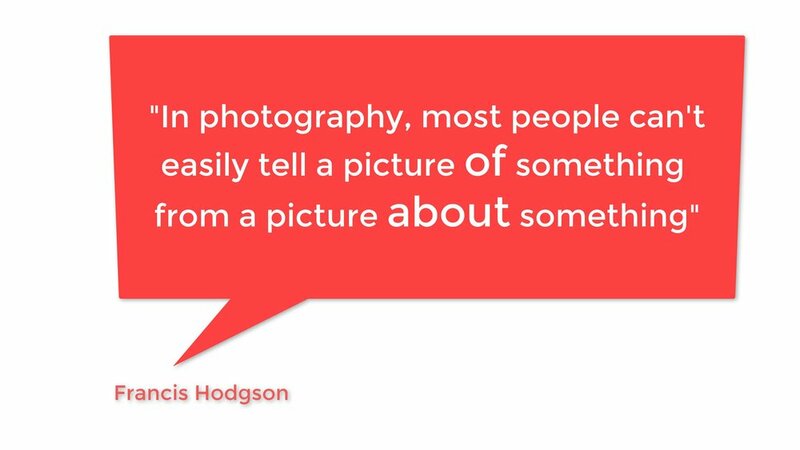 When we discuss personal photography, we refer to photography being used with the purpose of saying something that reveals the way the photographer connects, understands, and interprets the world. We are all different and unique, and certainly each of us has a very distinct way of relating to the world and its inhabitants, of processing the stimuli we receive, of thinking and feeling, and of making connections and finding conclusions. When we use photography with the intent of showing others (and ourselves) that personal way of connecting with the world, we are not just using photography to show how the world looks to us, but mostly how it feels to us. Contrary to what the term might imply, personal expressive photography is not the result of a unilateral, individual effort. It is more the collaborative result of a dialogue, a conversation among the photographer, the subject matter being photographed, and the observer of the final image. If the primary objective of personal expressive photography is to convey the intent and message of the photographer, this communication can take place at various levels. Every single image can communicate its message through different channels. 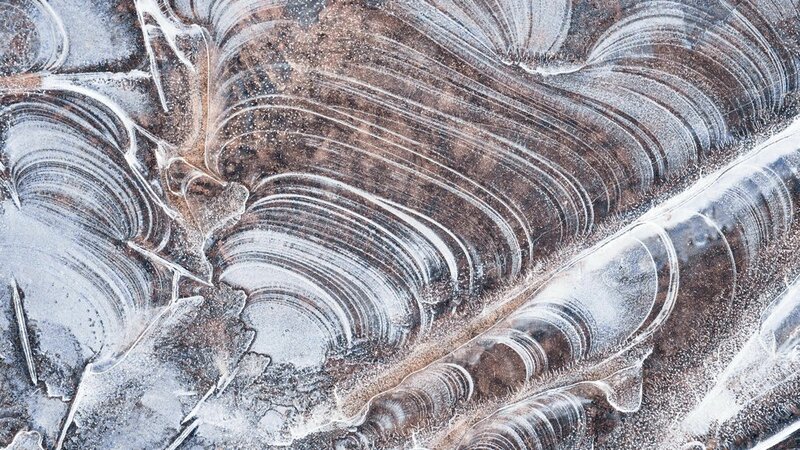 Through some of these channels, the voice of the photographer is clear and is heard by the conscious mind of the observers. 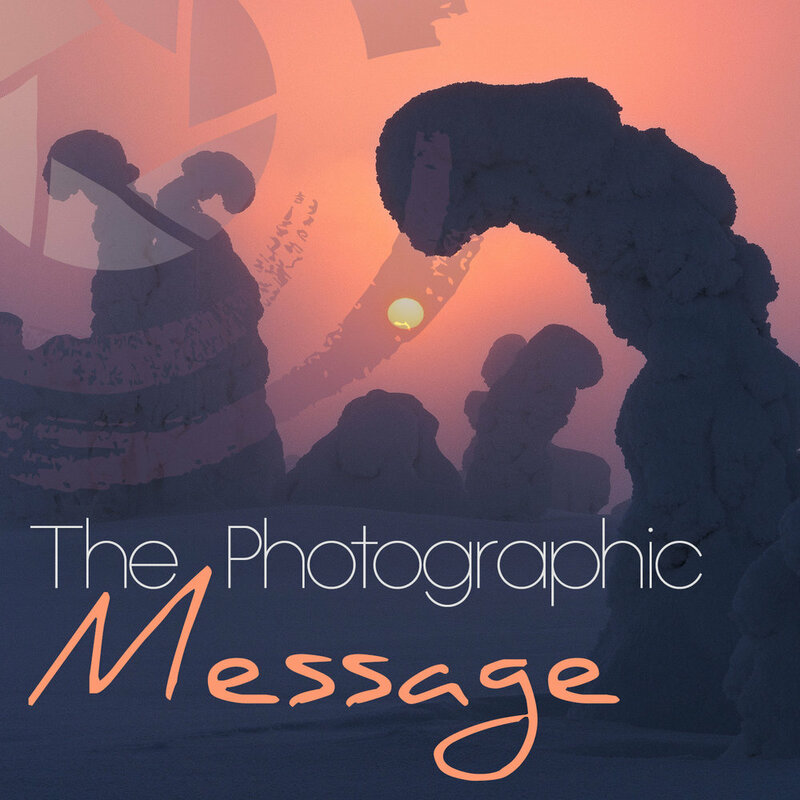 However, when other layers of communication are used, the message of the photographer is whispered through the subconscious mind of the observers, affecting the way they understand and decipher the visual message into a concept, an emotion, or a mood. Depending on the intent we select for our images, we might use only one layer of expression in our pictures. Most of the time, however, we will end up using a combination of different channels of communication. 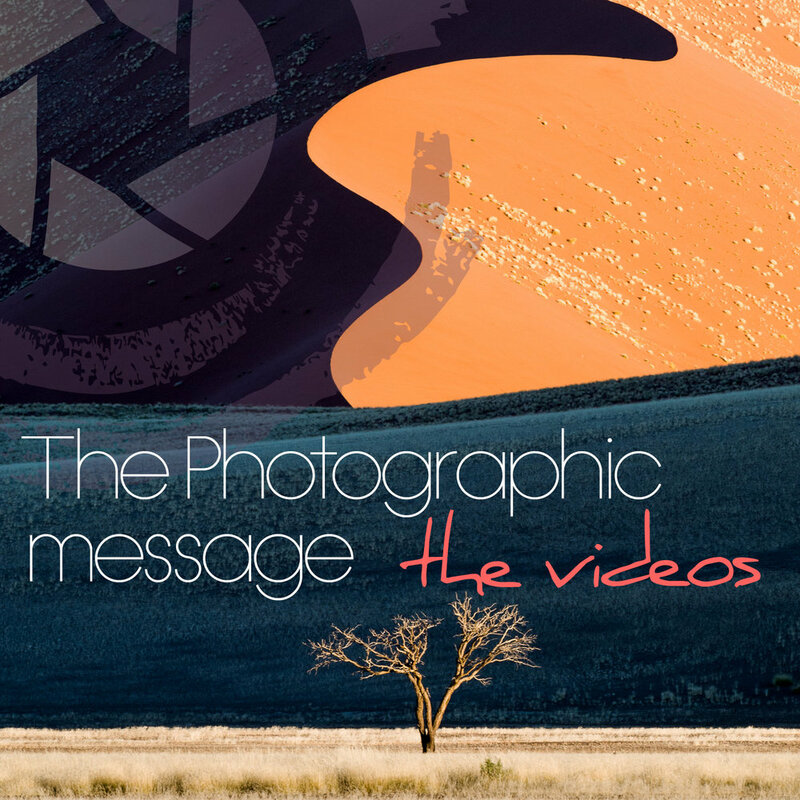 This will not only deliver a more profound message but also keep the attention of the viewer for longer, provoking more intense resonances, more emotional connotations, and allow us, photographers, to exploit all the communication potential of visual imagery. As mentioned by Francis Hodgson, when we know how to inject different layers of signification into our images, we stop making images of something and start making pictures about something. Everybody can see the light, but for us photographers, seeing the light is not enough. We need to understand it, breathe it, and feel it. We need to develop a subconscious approach, a sensitivity to light so developed that we are able to realize when light conditions evolve even without paying attention to them. We also need to be able to predict how light is going to behave, how it is going to change. Not only that, we also need to develop an awareness and a knowledge about how natural light (or light in general) transforms the subject matter, how it is reflected, diffused, and absorbed. In this module, we will cover most of the different situations outdoor photographers approach when working with natural light. Our goal will be to help you understand the different qualities of light and how they influence what we see and also how we feel about what is seen. We will analyze the different nuances of natural light, how weather shapes it, and how to plan and react to light when taking photographs in the field. 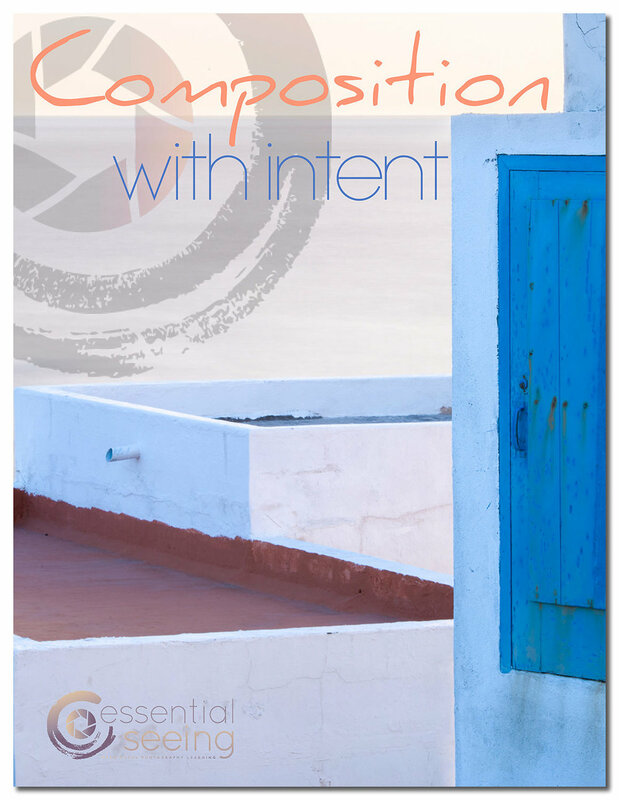 We will also discuss the coherence between intent and light, and how every single light condition can be ideal for a certain kind of message, emotional connotation, and subject matter. Resist the temptation to assume you know it all about natural light. Light is one of the most magical mysteries of the universe and the very raw material of photography. Knowing it all is impossible, and we humbly hope this module will increase your understanding and appreciation for natural light even more. Looking is not seeing - Engaging with the world as a photographer means we need to keep not only our eyes open, but also our mind and soul. Photographing the world means making statements about it, and if we want our statements to be meaningful, we need to fully absorb what is around us, understand the way it affects us, and then explore ways to communicate that effectively through photography. This is why learning to see, and learning how the camera sees, will not only make you a better photographer, but will also make you live in a more intense way. Photography is a vehicle for ideas, messages, concepts, and feelings. In order to convey them we use the visual language. As with spoken languages, the visual language can be learned, as it is ruled by visual grammar and syntax; this we know as visual design. Tone and color are the origins of all visual design. Tonal and color contrast help us see edges between elements and create the secondary elements of visual design that will be covered in this Module. Points, lines, shapes, textures, and depth are the raw materials and building blocks of all visual artists who use the visual language in order to transmit their messages, concepts, feelings, and emotions. Each of these secondary elements has its own characteristics, and in this Module, we will study how to use them effectively in our photographic work. Composition is simply the process through which the photographer turns idea into image. 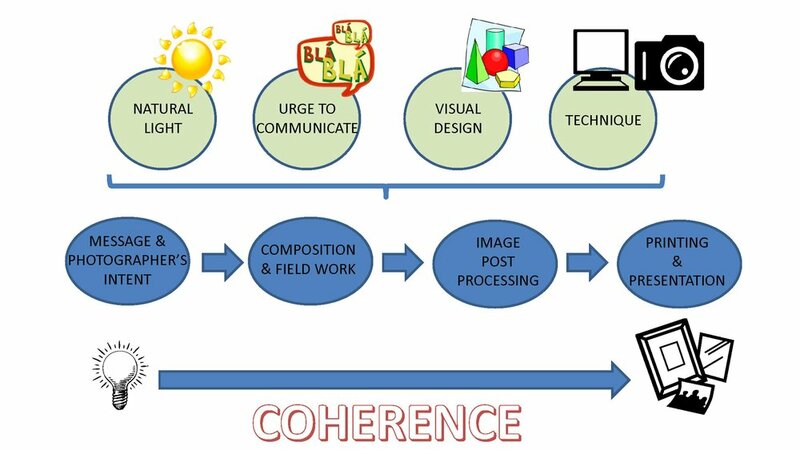 Good composition is making use of the visual design so that every single part of the image adds to the final message, working in unison with coherence toward a particular and deliberate intent from the photographer. The expressive possibilities of visual design cannot be understood as just the sum of each of the individual visual elements. Instead, when using the visual language, the whole is much more than the sum of the parts, and the expressive quality of a group of visual elements, when chosen and arranged correctly, will strongly reverberate as visual resonances. In good composition, one plus one is more than two. In bad composition, one plus one is zero. Good photographers, when in the field, dance with the landscape, camera in hand, paying attention to how the visual building blocks of the scene in front of them change, striving to find that position and exact moment where and when every single element in the scene just makes sense with all the rest and pushes forward the desired visualization, the searched-for emotion, and the elusive concept that materialized in the mind of the photographer when confronted with the scene. In this module, we cover the whole creative process when working in the field or in the studio, camera in hand. More than sixty different images made all over the world are analyzed and commented on in depth throughout two hours and fifteen minutes of fully animated videos. 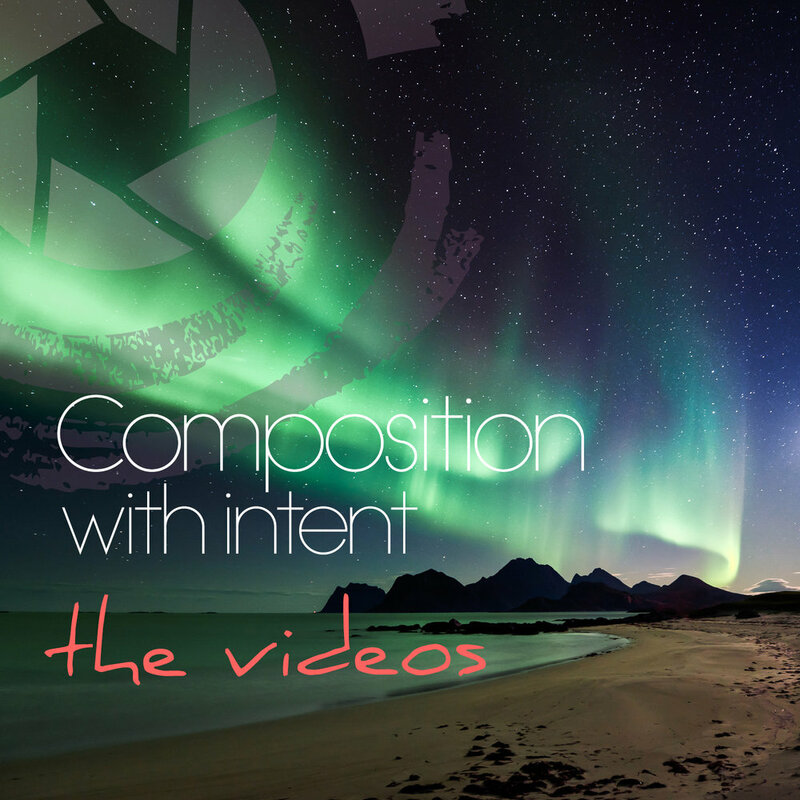 These videos tackle all the elements discussed in the written module of Composition with Intent. Mainly, we focus on Visual Design, Visual Dynamics, and Visual Relationships and how they affect the emotional connotations, the overall message, and the visual experience for the observer. Particular attention is also paid to balance, depth, and the influence of timing on the final result. These videos will help you see and understand visual imagery in a whole new and different way. Post-processing should not be considered a separate step in photography, but rather as the continuation, or should we say culmination, of a whole photographic process that started the moment we had an idea in our mind that we wanted to capture in a photograph. The most important thing in post-processing is to know what is the intent, mood, and message we want for the final photograph, to be able to see in our mind’s eye the final photograph the way we want it, and then to know in advance which adjustments of tone, contrast, micro-contrast, and color must be done in order to get as close as possible to that vision. Once we know this, the tool we use is irrelevant. This module and the corresponding videos will particularly focus on the WHY of post-processing, rather than just on the HOW, something that is seriously lacking in most courses and books about post-processing. Knowing what a slider can do is very important - brighter, darker, more contrast, less contrast, more detail, less detail, etc. - but the key to successful processing not only relies on the knowledge of what the sliders do and how they affect the look of your image, but also on knowing when you like what you see, or, if not, how to use the available tools to make the file look the way you want it to! Printing makes possible that final leap that makes a photograph exist, and that, in today’s virtual world, is more important than ever before. It is not only a last step of the photographic process like in the old days, but also the only way to guarantee we have indeed created something. In digital fine art printing, we open the door to a whole new universe. 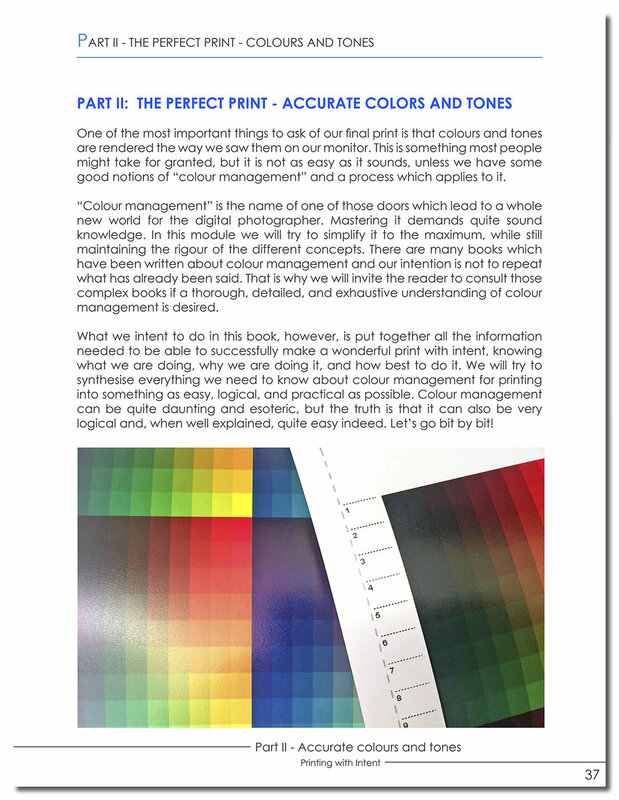 Aspects like color management, inks and paper, linearization and color calibration, printers and soft proofing need to be understood and mastered. The apparent obscurity and esoteric qualities of all these concepts have traditionally kept away most photographers, shy to open that door. This comprehensive module will teach you everything in a clear way. Color management will not be a mystery for you anymore, and you will be able to obtain prints that look exactly like you expected them to look. This module, intense and thorough, is aimed not only for those who want to print at home, but also for those who want to send their images to laboratories for printing. With these videos you will see practical examples of preparing files for printing, resizing, sharpening, soft-proofing, and simulating different papers and media. We will also cover from A to Z the preparation for printing by using Adobe Lightroom and Adobe Photoshop. 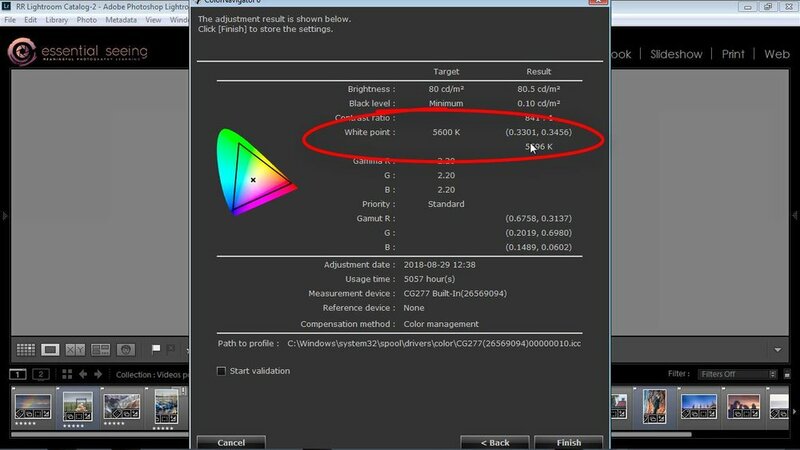 To end with, we will also show you an example of how to calibrate a monitor and how to obtain the profile ICC of a certain printer and paper. Mystery, timeless character, mood, ethereal qualities, simplification, departure from reality... These are just some of the reasons why photographers still produce wonderful images where color is absent. More so than ever, we have complete creative control at our fingertips when it comes to Black-and-White Photography - from visualization, visual design & composition, through technical and creative capture to powerful and unique creative processing on our home computers. In this module, we will review many of the aspects we have seen throughout the whole course, but in their particular application to Black-and-White Photography: Which are the subjects and emotions more suited to monochrome? How to visualize in black and white? How to compose? How to post-process? Visualize on the screen how to interpret and transform images into their monochrome versions, by means of global adjustments and local adjustments. 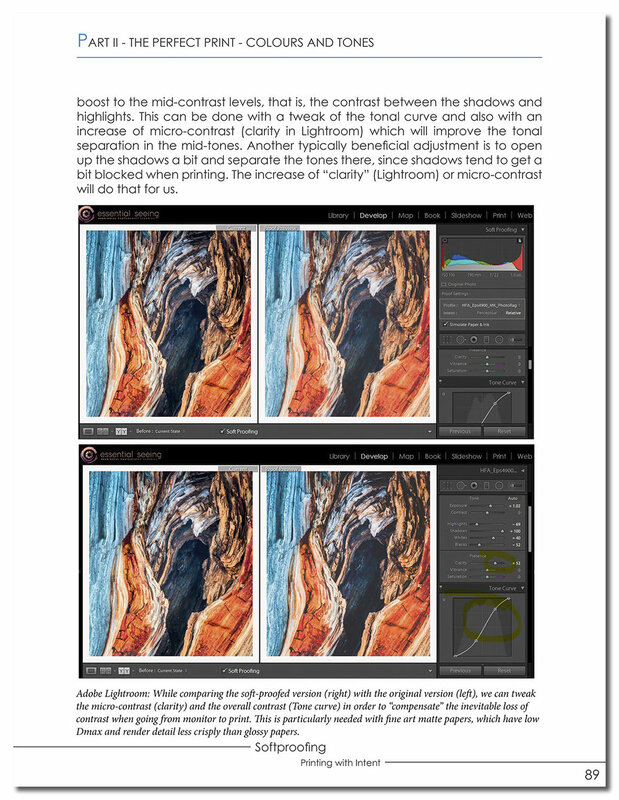 The software Adobe Lightroom will be used during these videos, but the explanations and the reasoning behind can be applied to any other software of post-processing. Again, we will focus on the why, rather than just the how. The last part of these videos, of more than one hour, will be devoted to matching intent and mood to the black-and-white transformation of a number of case studies. 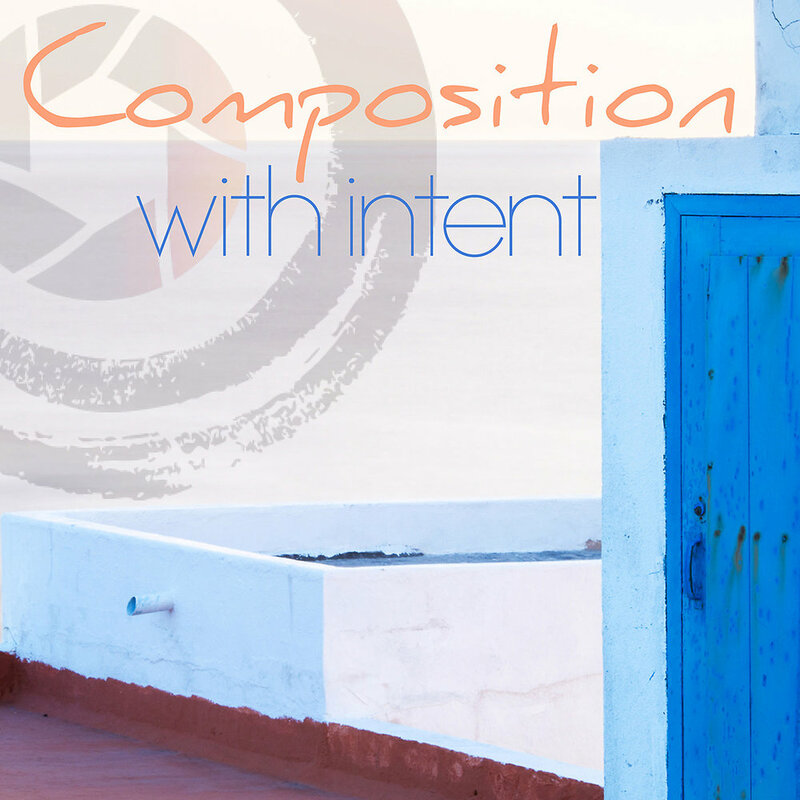 This is where tools are used with intention, according to the expressive goal of the photographer. Our last module “From Message to Print - The Videos” is the perfect way of finishing this Master Course, as we showcase the practical application of everything we have discussed during the preceding thirteen modules. On each of the videos of this module, we analyze a single image, and discuss the message and the intent, the compositional decisions that took place in the field, the light and weather that illuminated the scene and the visual design that builds the image. Then, we proceed to post-process the picture by paying attention to the composition and the visual experience and the emotional connotations we want to convey to the viewer. To end with, we soft-proof the file and prepare it for printing on the media most suited to the intent of the image. What is really amazing about this last module is the fact it is an ever-expanding one! On a regular basis, we will upload a new video of almost an hour of duration, analyzing a different image related to a different subject and environment. This will keep the Master COURSE always up-to-date with the last tools of post-processing, and allow us to keep this Master COURSE ever expanding. You will never stop learning! Total duration of videos: Each video makes around 45 minutes to 1 hour. New videos are regularly added to the Master COURSE, keeping it always up-to-date and ever-growing. You can pay the whole amount at once, or if you prefer you can pay it in 12 different installments. Please note that when paying the whole amount, a significant discount will be applied. HAVE YOU GOT QUESTIONS? WE HAVE ANSWERS! Do you expect to release this Master COURSE in a language other than English? Not in the short or medium term. It took us more than seven years to put together this course in English, and therefore versions in other languages will have to wait! This course caters to photographers of all levels. How is that, you might wonder? This course will not deal with the basic technical aspects of photography, since this knowledge is easy to obtain from manuals or other existing learning material provided by other authors. This course deals with the expressive and creative potential of photography, covering, in depth and with intensity, all aspects involved in the photographic process, from A to Z. Thanks to this Master COURSE, beginners and intermediate photographers will literally become advanced. Advanced photographers, in turn, might very well experience an inflection point in their philosophy and practice of photography. If you are an advanced photographer who is able to produce at will aesthetically pleasing images but who feels that something is lacking, then this course is made for you. It will expand your views, push you to abandon old ruts, leave your comfort zone, and experience a change of mindset when it comes to your photographic practice. What if I do not like the Master COURSE once purchased? We are one-hundred-percent certain this Master COURSE will make you a much better photographer. That is why, if after having gone through the course for the first thirty days you feel that it cannot help you make more meaningful photographs, talk to us before those thirty days are up and we will give you a full refund. Can I purchase just a few modules of the Master COURSE? No, since if we let you buy isolated modules, you will not learn as much as you could with the full course! Final printing and presentation of the image is the logical culmination of the whole process. When purchasing this Master COURSE, you are not buying a “bunch of ebooks and videos,” but enrolling in a whole learning program. The unique and valuable character of this Master COURSE resides not only in the quality of the different isolated modules it consists of, but in the way they are linked together. Just like in good photographic composition or in good cuisine, one plus one is more than two. Am I required to finish one module before starting another? No. Once you have purchased the Master COURSE, you will have free access to all modules from day one, and therefore you can jump from one module to another at will, with total flexibility. That being said, and for the reasons stated above, we cannot overemphasize the importance of following the order and structure we have laid out for the course. Only like this will you take full advantage of the Master COURSE. How can I pay? Are my payment details secure? We wanted to make payments as easy and safe as possible. This is why we use Stripe to process the payments, one of the most widespread, trusted, and safest payment gateways available on the market right now. When you pay, only these gateways receive your confidential personal information. This information is not shared with us nor our server, so even if the security of our website were to be compromised, you would be totally safe. Furthermore, our website is SSL secure, and you can access a constant, secure connection on every page of our site. Our website has SSL security enabled. Our visitors can access a constant, secure connection on every page of our site. Through SSL, you will see a lock icon next to our URL in the browser, showing that your information is safe. Secure Sockets Layer, or SSL, is a technology that secures the connection between your browser and the website you’re visiting. To verify that SSL is protecting a page, look for a URL beginning with https://, instead of http://, and a green, closed padlock icon. This means that you can navigate the website and submit information through a secure connection. Data integrity: Prevents unauthorized parties from altering data during transmission (such as during a Form Block submission). Can I pay in separate instalments? Yes, you can. When enrolling in our Master COURSE, you can decide whether you want to pay the whole amount straight away, or whether you would prefer to pay it in twelve separate instalments. However, when paying the full amount up front, a significant discount will be applied. Bear in mind that there is a full money-back warranty of thirty days, so you do not really run any risk when paying the full amount at once, and you can benefit from a good discount. How can I access all the Master COURSE material? Once you have proceeded to the payment, you will be able to create your account with a username and log-in password. From that moment on, you will be able to have private and exclusive access to the Master COURSE area of our website for two full years. From there, you will be able to download all the PDFs corresponding to the learning modules from day one. You will also be able to view all videos in streaming, without having to download the large files, and be able to watch them directly from any mobile device or computer. How long does it take to fully complete the Master COURSE? This Master COURSE consists of fourteen different modules, around 1’000 pages of written content, and dozens of hours of video. For a normal person with limited amount of time available, this course might take from six to 12 months to be completed, by allotting a few hours every week, enjoying the process without it becoming a burden. That being said, you can also finish the Master COURSE in two or three months if you do not sleep at all, or take as long as twelve months if you want to take it easy. It is up to you. What is important is that this Master COURSE has been designed and created not only to help you become a much better photographer, but also to fully enjoy the learning process. Learning should be fun, and addictive! How much time do I have to complete the Master COURSE? Once you enroll in our Master COURSE, you will have two full years of free access to the Master COURSE area. This is plenty of time to fully go through the course even at the slowest pace, without having to stress. Bear in mind that during this time you will be able to download all the PDFs, so that means you will in any case keep all that material with you, even when the twenty-four months expire. In order to keep the videos up-to-date and limit the hassle of downloading heavy files, videos can be viewed in streaming. As you have twenty-four months of connection to the Master COURSE area, you have plenty of time to review them again and again! Do I need to be a techie to take this course and use the website? No, you do not need to be an expert with computers, or be a geek when it comes to cameras and devices! Our whole Master COURSE revolves around expression, intent, and creativity. Sure, there are many aspects that are quite technical… but we have spent a lot of time to provide all the details, in depth, with a language that will allow anyone to ultimately understand it all. The website and the material has also been designed with ease of use in mind. And if you have any problem, we will always be here to help. Is this Master COURSE just for landscape photographers? Not at all. Our Master COURSE caters to creative photographers who use photography as a tool of personal expression. If you conceive of photography as a tool that allows you to express feelings, concepts, thoughts, emotions… then our Master COURSE is for you. Many of the examples and case studies that have been used throughout the Master COURSE revolve around landscape and outdoor situations. However, all concepts discussed are general and apply to any expressive photographer, no matter what they photograph. In fact, there are quite a number of examples that focus on still life, conceptual projects, etc. One of the things that you will learn throughout the Master COURSE is that, when approaching photography as a tool of personal expression, the subject matter is very often different from the subject of the photograph itself. When you use non-literal channels of expression like signs, symbols, metaphors, and connotations, you can photograph a landscape, a portrait, or a still life and still be referring to the same concept, emotion, or feeling. In other words, personal and expressive photography is not bound to subject matter. This is why this course will help you, no matter what subject matter you photograph, and help you identify, hone, and cultivate your own personal vision and expressive potential.